The studying of and research into English linguistics, literature and culture(s) has a long tradition in Greifswald, which has been shaped by academic curiosity and the desire to teach living cultures since the 18th Century. A first senior lecturer position was created in the budget for summer semester 1881 and in 1908 a full professorship for English Linguistics and Literature was brought to life. From thereon in, the Department of English in Greifswald experienced rapid growth. Before the Modern Languages Seminar was founded in 1882, the English courses were mainly based on English language courses. The basis for the linguistic exercises were individual works of English literature. One of the first works, which was read from summer 1780 onwards, was Milton’s Paradise Lost. Furthermore, English literature works were interpreted regularly, such as Shakespeare’s Romeo and Juliet and Macaulay’s History of England. In 1853 the modern language received a better fundament as part of the Department of Modern Languages. Lecturer Dr. Bernhard Schmitz also gave private lessons in English writing and speaking. Prof. Schmitz was Greifswald’s first modern linguist, who looked at the study of Old English in his courses. During the last third of the 19th Century the study of modern languages and literature in Greifswald became increasingly important. In 1882 the Modern Languages Seminar was created, which was made up of a Department of French and a Department of English. The founding of the Modern Languages Seminar marks the start of actual modern studies of English Linguistics and Literature in Greifswald. The course’s emphasis was on historical grammar, Old English literary history and Old and Middle English language practice. Translations of German texts into English and English conversational practice completed the students’ education. In 1886 the first Englishman was employed as a teacher at the Department. George Herbert Clarke from Clare College in Cambridge gave courses in English linguistics and on modern English literature. Lecturer Edmund Crosby Quiggin gave a lecture on American literature in the winter semester 1899/1900, which was the first course taught on American literature in Greifswald. From 1898 onwards, regular courses were given on English history and geography. Phonetic exercises began in summer semester 1902. The separation from the Romance department was finally completed with the founding of the English Seminar in 1911. In 1923 the English Seminar moved from the Domstraße into the building in the Wollweberstraße 4 and was relocated to the University Main Building in 1930. The Anglicist completed secondary school in Stralsund in 1920 and then studied the subjects English Studies, German Studies and History at the Universities of Rostock and Greifswald. After passing her professional examination for teaching at secondary schools in 1926, she did her practical training as a Referendar in Szczecin and Lębork (then part of Pomerania). In 1927 she successfully gained her PhD at the University of Greifswald. 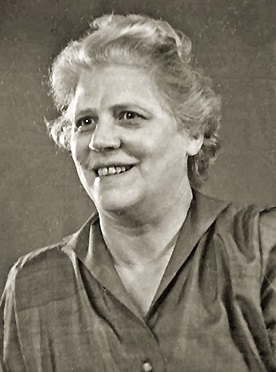 Käthe Kluth was the first female professor at the University of Greifswald. The Käthe Kluth Scholarship of the University of Greifswald, which is now awarded to support female junior academics, was named after her. The First World War slowed the development of the Department of English; only a few courses were held. Normal lecturing didn’t recommence until 1920. In the following years, the Department saw a substantial rise in the number of students. Whilst in 1928 there were only 100 students of English in Greifswald, in the summer semester 1930 there were already 187 students. That meant that the English Seminar was amongst the most popular language departments at the University of Greifswald. At the same time the library also experienced considerable expansion. Lots of books, but above all magazines were included in the collection. The research group for English history and geography (“englandkundliches Archiv”) was created in 1937; its goals included maintaining German-English cultural relations [...] and the cultural and political instruction of the students. Again a war inhibited the Department’s work, although lecturing was continued. In 1951 the English Seminar was transformed into the Department of English. At this time, special emphasis was placed on the linguistic training of the students. Phonetics and intonation exercises with the analysis of gramophone records were introduced. In 1951 the specialisation of the Department of English was completed with the creation of a linguistic and a literary branch. The length of studies was increased to 5 years. The Department of English has been located at Steinbeckerstraße 15 since 1948. Students have access to the comprehensive library in the same building, whose oldest work (George Sandys’ A Relation of a Journey begun An. Dom. 1610) was published in 1637. On the 9th January 1956 the Department of English’s library was home to 10,564 volumes. (Source: Prof. Dr. Käthe Kluth, in: Festschrift zur 500 Jahrfeier der Universität Greifswald, 17/01/1956, Volume 2). This excerpt from Sonja Funcke’s (born 1927) study book from summer semester 1948 shows entries from Prof. Dr. Käthe Kluth and the Anglicist Prof. Dr. Martin Lehnert who enjoyed national recognition at that time. Study books were the paper “predecessors” to today’s electronic transcript of records (click to enlarge). The Department has also successfully mastered the transition into the 21st Century. Following the Reunification in 1990, the Department was transformed into the Department of British and North American Studies, which was home to three chairs: English and North American Literature, English Linguistics, and Historical English Language and Mediaeval Studies. Further academic areas were created to cover geography and history/cultural studies, language practice and the teaching of English. From then on, the Department offered degrees in Lehramt Gymnasium and Regionale Schule for English (teaching degree grammar and secondary schools) and Master of Arts. The Department experienced some turbulences during the first decade of the 21st Century due to the restructuring of the Faculty of Arts and Humanities and the modularisation of the degree courses on offer at the University. The Department was quick to adapt the Magister degree into the consecutive bachelor’s and master’s degrees The teaching degree qualifications were modularised in 2012 and the State Examination (Staatsexamen) was retained. The staff structure of the Department of British and North American Studies was changed in 2007 to concentrate on the two central competencies, English Linguistics and English Literature, complemented by the two teaching areas language practice and the teaching of English. After its long and changeable history, English linguistics and literature are still taught at the University of Greifswald with a new staff structure and new teaching and research foci, which cover the degree courses for bachelor’s, master’s and Lehramt (teaching) qualifications.